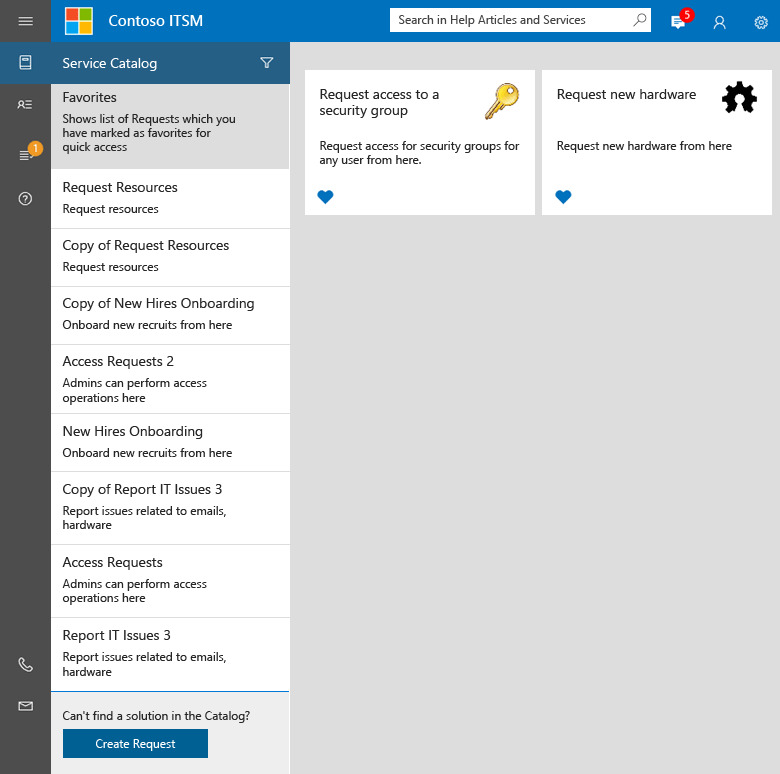 The Self-Service Portal provides web-based access to the features of Service Manager. 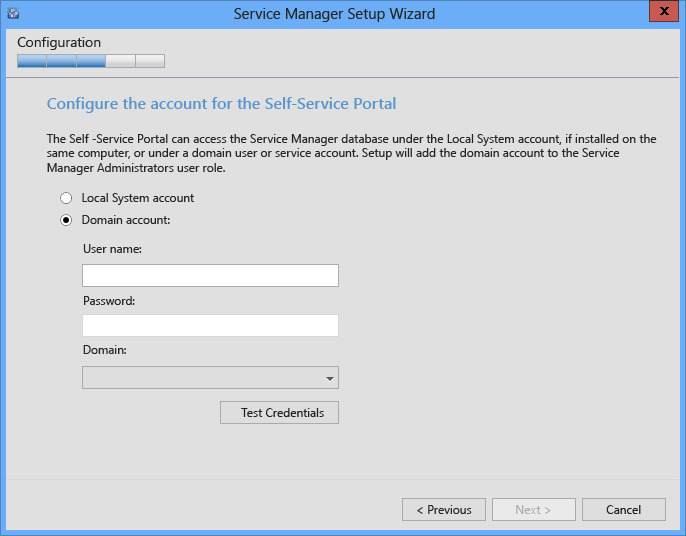 This section describes how you can deploy the Self-Service Portal, and customize it. 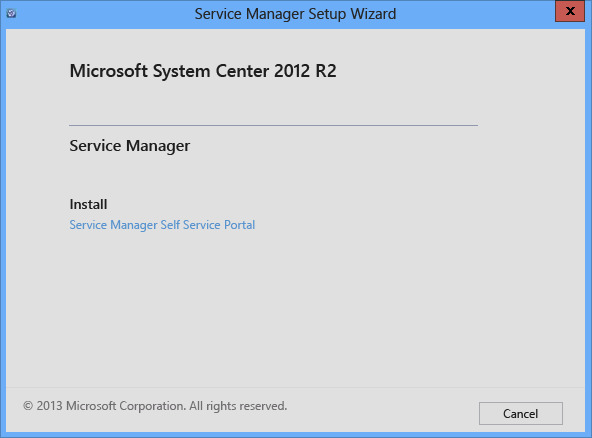 In order to deploy the new Self Service Portal, you must have System Center 2012 R2 Service Manager Update Roll-Up 7or later installed. Additionally, it is not recommended to install the Self Service Portal on the same server as the primary Management Server. To configure Service Manager, import the Portal.mpb management pack, which is provided in the Update Roll-Up package, using the Service Manager Console. This contains new, light type-projections used to load My Requests & My Activities. Without the new Management Pack, web pages won’t load the items. You'll use the following sections to set up the Self Service portal. Select a Windows 2012 R2 server. Join the server machine to the same domain where the Service Manager SDK Service is running. Ideally, on the secondary server. 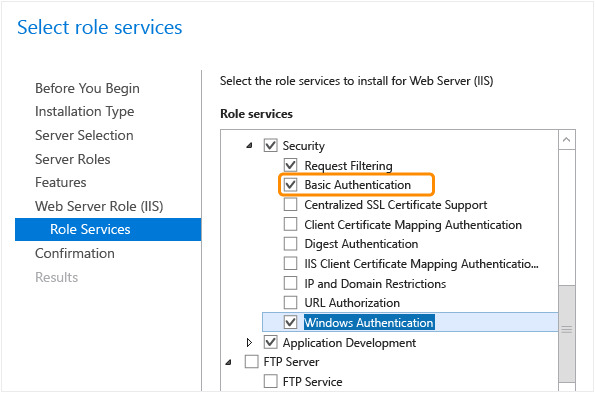 Enable the IIS role and ASP.NET 4.5 on the server using following steps. Start the Add Roles and Features Wizard and then enable IIS. 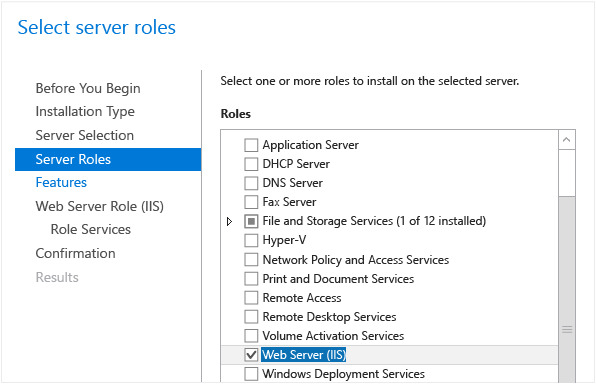 Enable the following role services on the Web Server Role (IIS) page. 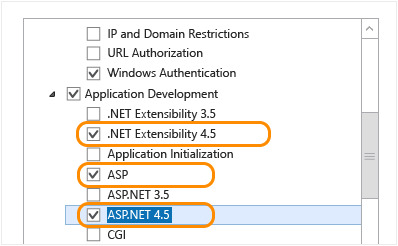 Add Application Development and under it, add .NET Extensibility 4.5, ASP, and ASP.NET 4.5. 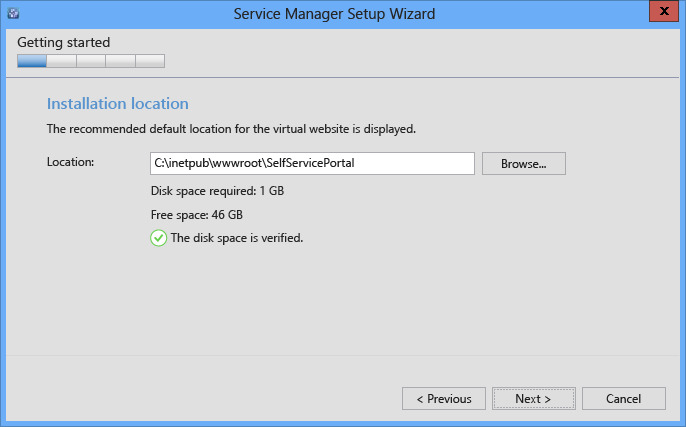 Use the following steps to install the Self Service Portal WebApp using Setup. 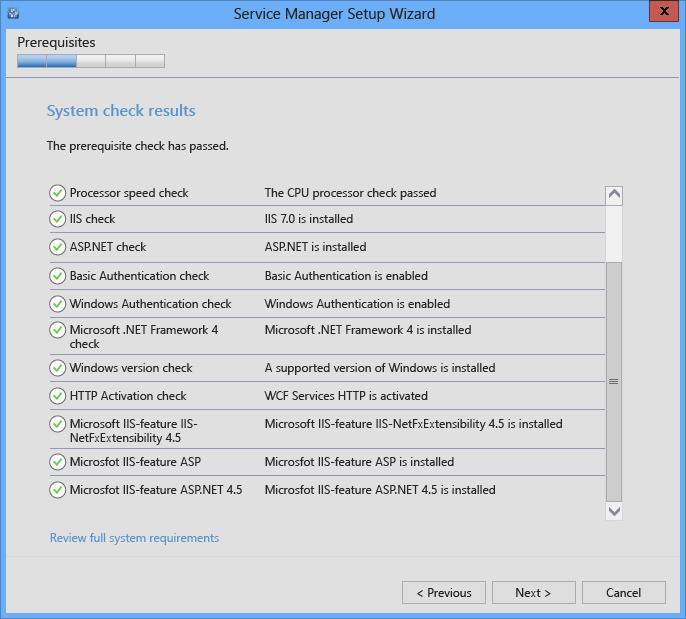 Run SetupWizard.exe in the Setup folder to start the Service Manager Setup Wizard. 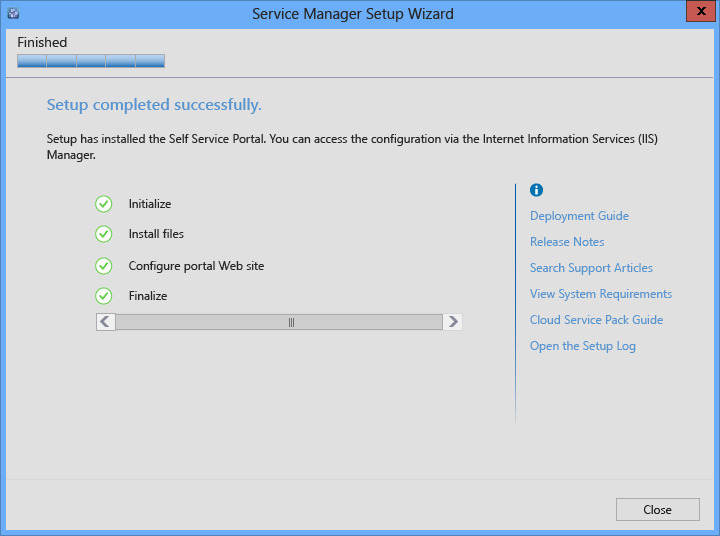 Under Install, click Service Manager Self Service Portal. Review the System check results. 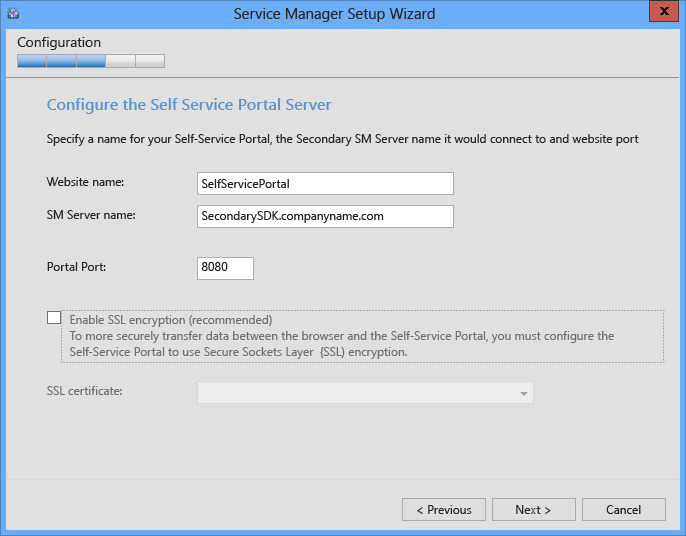 Configure the Self Service Portal server and type configuration details for your server. WebSite Name : The name of the website to display in the IIS Management console. SM Server name: You can provide a fully-qualified domain name or the NetBIOS name of the server running the Service Manager SDK service. We recommend that you use a dedicated secondary Service Manager management server to communicate with the portal. Portal Port: The port number that the website will use. SSL Certificate: (Optional) The SSL certificate to configure the website in secure mode (https://). This is the recommended setting if you are using Basic Authentication. The default is Windows Authentication. Configure the account for the Self Service Portal. This is the account that the IIS instance will run under. This account should have the Service Manger Admin role. The Diagnostic and usage data notification information is displayed, informing you that data is sent to Microsoft by default. 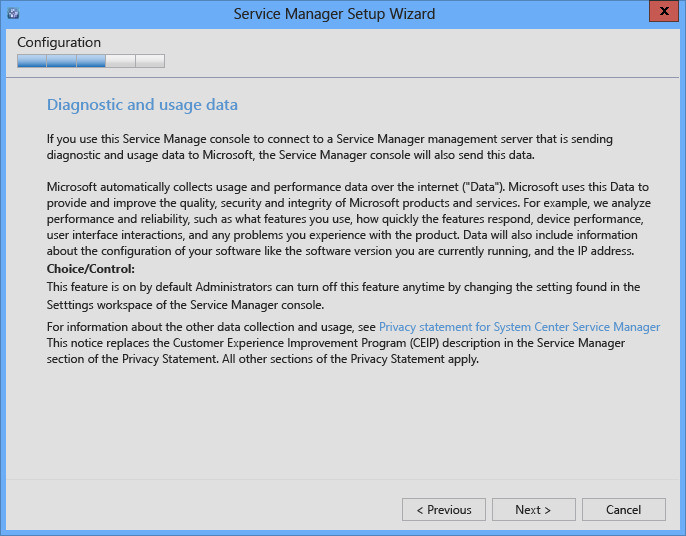 You can change this setting in the Service Manager console. Click Next. 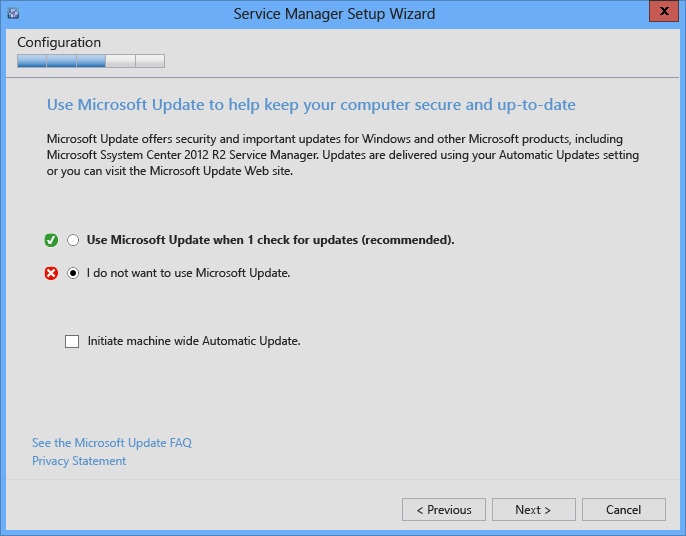 Choose whether to automatically install Microsoft updates. You can modify the following example to install the Self Service Portal. Use the following step to complete your installation. Restart IIS. You can access the Web App (http://yourwebsite:port) in your browser. It will resemble the following image. The following section describe how you can customize the Self Service Portal to suit your organization. The <appSettings> tab in the Web.config file offers some standard settings to easily customize and personalize the areas which are most often modified. Here’s a list of them. GenericOffering (<language>) The value of this key accepts the name of the request offering, which is mapped to the Generic Request button for a specific language only. This Generic Request button is used when a user can’t find an appropriate request offering in the catalog. You can create multiple keys like this to map different request offerings for different languages to the Generic Request button. CustomActiveRequestStatusEnumList By default, the Self Service portal puts custom enumerations for My Request (incident and service requests) states in the Closed filter category. This key allows customization to map required custom states to the Active filter category. The value of this key should be a comma separated list containing EnumTypeName values of enumerations which are required to be mapped with the Active category in the Self Service Portal. You can look for desired custom states labeled EnumTypeName in the EnumType table, using the following example. CompanyName The value of this key appears as the company’s name inside the portal. CompanyLogoLocation The value of this key is used as the image file, which is displayed as the company’s logo inside the portal. ITPhone This key takes the value to configure the IT help desk’s phone number. This information appears at the bottom of the navigation menu. ITEmail The value of this key is used configure the IT help desk’s email ID. This information appears at the bottom of the navigation menu. DefaultLanguage By default, the portal web pages are loaded as defined by the browser’s language. Then current user can manually select the language in the top-right corner of each page. The value of this key defines the default failover language which is chosen by the portal, when the browser’s language is not available. GenericOffering The value of this key accepts the name of the request offering, which is mapped to the Generic Request button. This Generic Request button is used when a user can’t find an appropriate request offering in the catalog. SDKServerName The value of this key defines the name of the server where the Service Manager SDK runs and it is used to interact with other Service Manager servers. By default, it has the same value that you provided in Setup. You can use the fully qualified domain name or the NetBIOS name of the server running the Service Manger SDK service. We recommend that you dedicate a secondary Service Manager management server to communicate with the portal. MaxQueryResults The value of this key defines the maximum number of results that are returned by any query form element inside your request offering forms. UserCacheTimeout The portal uses a caching infrastructure to provide a swift user experience. The value of this key defines the timeout, in seconds, to cache user-specific details of the signed-in user. DataCacheTimeout The portal uses a caching infrastructure to provide a swift user experience. The value of this key defines the timeout, in seconds, to cache generic data which can be shared among different users. EnableTelemetry The value of this key defines your selection about participating in Microsoft’s Customer Experience Improvement Program. Your portal sends usage telemetry data to Microsoft when this key is marked as “True”. By default, it has the same value that you chose during Setup. You must restart the IIS service after you make any changes to the Web.config file. Web page style, such as font, color, and background, is customized by adding the Custom.css file in the \Content\css website folder. Styles defined in the CSS file overrides the default styles of the Self Service Portal..
You can modify the content shown in the left navigation bar (menu) by editing the Sidebar.cshtml file which is in the \Views\Shared inside the website folder. You can add or remove shortcuts from the menu, and you can customize them with details for the CSS class, keyboard hotkeys, and others. 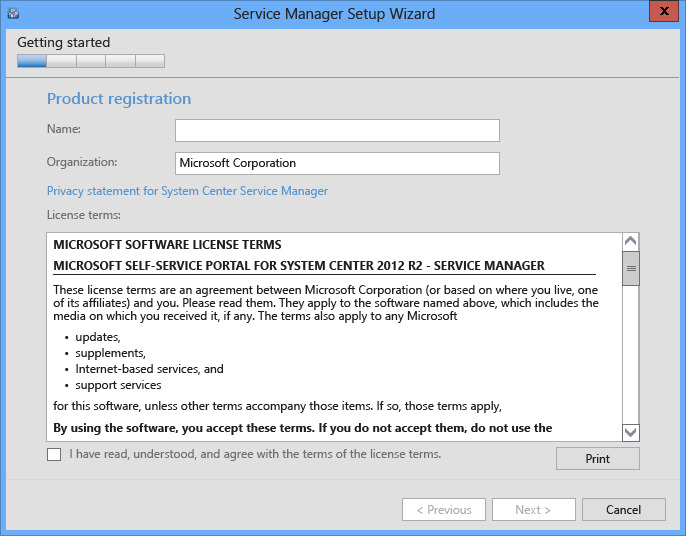 For more information about UI customization, see The Official System Center Service Manager Blog.